Most of us know the feeling of getting home late from work, stomach grumbling and eyes searching the cupboard for anything edible. In these moments, the prospect of chopping vegetables, turning on the stove, and preparing a healthy meal from scratch can seem daunting. There’s no denying it — busy schedules and ample food delivery services have made it easier than ever to not think about the importance of cooking healthy meals. But eating healthy doesn’t always mean standing in front of the stove for an hour before each meal, interpreting the ingredients in some new and complicated recipe. Here are some tricks and techniques you can use to find time to cook. To prepare food, you need ingredients. If you’re new to making meals, stocking your pantry is an essential first step, and one that will ensure you don’t have to run to the grocery store with each new meal. The Food Network has a good checklist of pantry essentials that one can bring to the grocery store. The list includes everything from common spices to canned goods to baking supplies. Going on a one-time pantry stocking trip will save you countless hours in the long term. Here’s a cheater’s tip for buying ingredients: look for items that already have some of the prep work done. Pre-washed spinach, canned tomatoes, and seasoning mixes or sauces can save you the trouble of making absolutely everything from scratch. The phrase “slaving over a hot stove” shouldn’t always carry negative connotation. 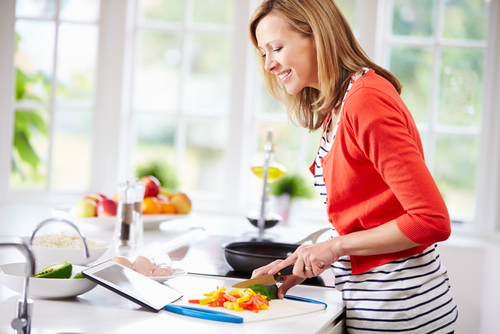 Pair your healthy meal making with an activity you genuinely enjoy. By listening to podcasts, getting caught up on the latest television show, or listening to your new favorite album, you’ll begin to associate cooking with the positive activities that you look forward to. Now that you have a well stocked pantry and your latest musical playlist queued, the next step is finding the time to cook. The rush of the work day can mean there isn’t always time to make a new meal each day. So don’t — consider setting aside one day or afternoon every week to prepare your healthy eats for the seven days ahead. If you don’t want to prepare entire meals, take this time to do the prep work for the rest of the week. This could involve buying groceries for all the meals you have planned, cutting vegetables in advance, or cooking a pot of brown rice or quinoa that you can store in the fridge for use throughout the week. Spreading these little tasks over time will help the whole process of cooking seem less arduous. By preparing three or four different meals — for example a salad, soup, and two main courses — you’ll guarantee there’s enough variety in your food to get you through the week. Ensure you have a good supply of Tupperware containers or mason jars on hand to store your prepped meals. Keeping the food airtight is an important step in keeping it fresh for later in the week. Once you find a healthy and simple meal to prepare, keep it around for next time. So much valuable time can be wasted selecting which meal to cook. Wouldn’t you rather have a collection of tried and true recipes you can draw on when busy? Whether that involves physically or virtually bookmarking the recipe or sticking a copy on the fridge, having a list of go-to easy and healthy meals will mean you always have a recipe to turn to in a pinch. If you’re not sure where to start, several food websites and blogs have created compilations of “healthy 10 minute meals” and “fresh weeknight meal plans” that you can use as a source of inspiration. The best part about cooking healthy and delicious meals is that you and your family immediately reap the rewards. Bon appétit!